This is my picture of my Buddhist shrine at night. It is busy with a lot of Buddhist, non-Buddhist and secular objects. Perhaps this shrine displays my attachment to the material world? Maybe this doesn't exactly fit with Buddhist beliefs, but I think that we should acknowledge the parameters in which we live. 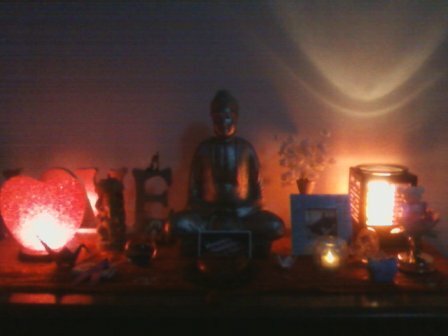 Nevertheless, I like turning off the other lights in my room and lighting the shrine and just sitting in quiet meditation. Eventually I'll post a daytime picture. While I'm talking about altars and shrines, have you seen Altar-Bot? It's one of my favorite websites because it proves that there really is no right or wrong way to meditate or design a sacred space. I would say that the freedom to develop one's own spiritual practice within Buddhist beliefs is one of the defining reasons that I'm Buddhist. Posted as part of Pink Saturday. You have a lovely and interesting blog. I love to read about spiritual matters of all kinds and enjoy your pov. Your altar looks like the perfect place to meditate. Happy 4th of July and PS! You've created a nice space to come and meditate. There is so much to be said for quiet meditation. Thank you for stopping by my place. Thanks for stopping by my blog and leaving a comment. I'm now following you back. I agree that we need to "create" our own sacred space. It's even one of my painting's inspiration...a sacred space for a sacred moment. Thank you all for visiting my blog and for your kind comments. I love reading your comments and visiting your blogs as well. informative, love to learn from you.